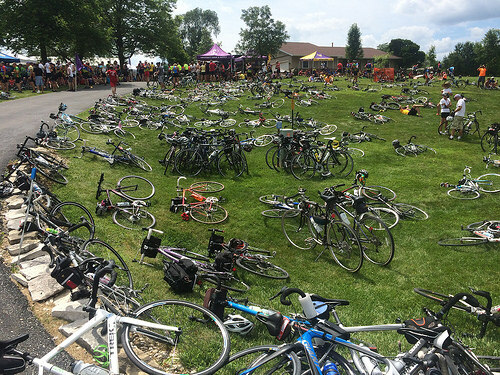 RAGBRAI (The Register's Annual Great Bicycle Ride Across Iowa) was an amazing adventure. We started off in Sioux City, Iowa and eventually landed in Davenport Iowa 520 miles/ 7 days later. Most days we rode approximately 70 miles. Being the over achiever, I also did the optional Gravel Loop for obvious reasons - it's gravel, super fun and yes, I did it on my skinny tires - and the optional Century loop (because I'm a miles junky). Miles and miles of cornfields and roads. There were some great hills, tough headwinds, storms, and heat. It was great. The riding was super varied every day. One day we encountered 4,000 ft. of climbing, and the next almost no elevation change. There were times when you could go fast and put in a good work out and other times where you just had to go with the flow. Riding with anywhere between 15,000 to 20,000 riders you are never alone. One of the best things was randomly hearing "HALF ACRE" as someone rode up behind me and that person talking to me about beer and the team. While on the ride, I ran in to many Chicagoan's, including a few SpiderMonkeys. The whole ride was full of food, beer (sometimes free! ), crazy locals, and animals. An all around good time. If you've every thought about doing it you should! The fanciest of Iowan goats.